We know for a fact that we have a few lady readers, so this one is for all of you. 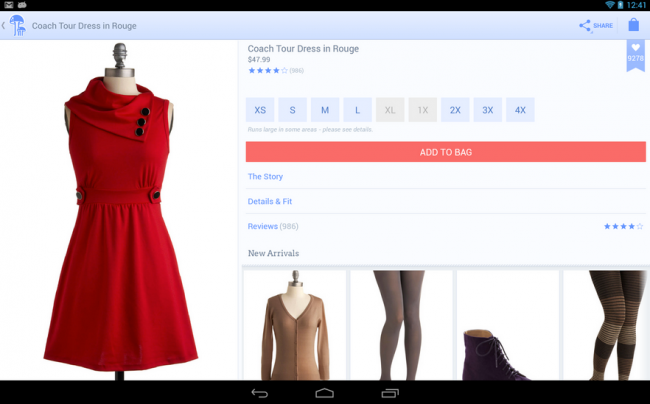 ModCloth launched its official application on Android this morning, which means you are now only “a couple of clicks away from fab fashion.” That’s right, I said fab fashion! With ModCloth, you can browse an enormous inventory of “cute” dresses, vintage clothing, and even home decor. It’s free on Google Play, and the developers are touting its strict adherence to the Android team’s design guidelines. From the video we see below, it does look smooth and responsive; definitely not a janky app.